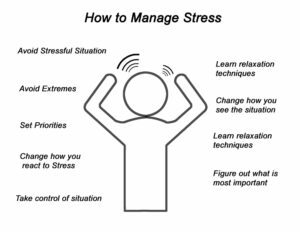 Managing stress is important to know how to control, whether it is due to work or something that is occurring outside the workplace not recognising or managing stress may result in you becoming ill, either physically, mentally or both. Your employer has a duty in respect to your health, you must tell your supervisor if you are suffering stress even if it is related to a situation outside your work. We all sometimes talk about stress and feeling stressed, sometimes due to people making unreasonable demands, or because we feel that we have no control over situations that we are dealing with. Often it is because we have too much to do and too much to think about and are struggling to juggle with the many things we are expected to deal with. Stress is not a medical diagnosis, but when we have severe stress that continues for a long time it could result in a diagnosis of depression or anxiety, or more severe mental health problems. 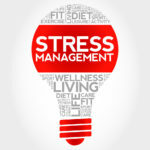 Identifying the things that cause your stress and learning how to handle them better can reduce the effects of stress. Relaxation techniques and other Lifestyle changes can also help. Change and a lack of control over what is happening are recognised as situations which can cause a high level of stress. Bereavement or serious illness in yourself or someone close can be seriously stressful, but stressful situations are not always sad or bad events, sometimes happy events can cause stress because they bring change or make demands on you, for example moving house, getting married, having a baby. When people think about stress they often think that it is a result of having too much going on, however not having enough work, activities or change in your life can be just as stressful as having too much activity and change to deal with. There is a positive side to stress. A certain level of stress may be necessary and enjoyable in order to help you prepare for something or to actually do it. Where stress is due to the pressure of trying to do too much and having too much work to do, planning can help in making the best use of time for work and other things including time to relax, time for leisure, exercise and holidays are just as important as spending time on business or worries at home. Remember that a little stress is good for the body and alerts the mind. But it needs to be limited and to be followed by a period of relaxation. There is no value in stressing over things you cannot change, so try to accept them. Changing your own attitude and not allowing things that you don’t like but cannot change to cause you annoyance or resentment will help to reduce the likelihood of you becoming stressed.